Tuesday was my first day back at school. Because it has been really really snowy in my village, my dad didn't go into his office but went on a walk instead to watch the roe deer. 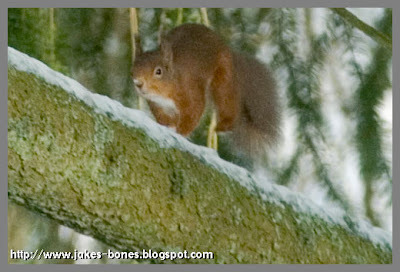 When he was watching the deer he turned around and saw a red squirrel in the tree and was lucky to get a picture of it. I think red squirrels are quite beautiful. There aren't many of them, only 140,000 in Britain, and most of those live in Scotland. There are twenty times as many grey squirrels ! Red squirrels live in all the deer woods we go to, and one time me and dad were watching red deer in a wood when I saw a red squirrel come really close. Red squirrels love pine cones, and there are lots of pine trees in the woods around my village. At this time of year, when it is cold, squirrels can stay in their houses, called dreys, all day long. You can't really see it in this picture but they have tufts on the ears. I have a red squirrel skull that I found in the secret vault in the same woods. The skull is not the best because it doesn't have the jaw bones, and only one of the back teeth is left, and the nose bones are damaged. It has big incisors at the front like a rabbit, but it doesn't have the peg teeth behind them like a rabbit does. 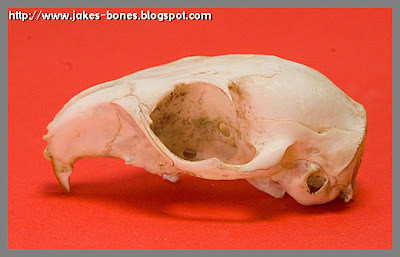 It would be cool to find a whole red squirrel skeleton, or a skull with both jaws. Cool ! Lucky sighting and really great pictures !